The sculpture is often used to represent philosophy. Many have interpreted it as a person, not exactly Dante, who is contemplating deeply. Artistically, it has been analyzed as a person with an athletic body that is twisted and curled in tension. For artists, it represents an internal struggle with something that is intellectually tough. The open left hand is meant to grasp whatever reality his vision brings and he is ready to act on it. 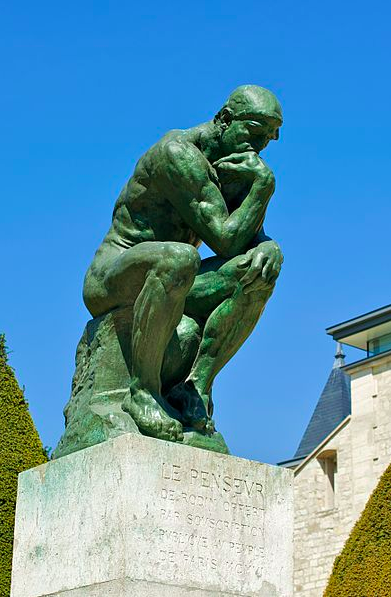 Others think that it is Dante, looking down the characters from his epic poem, while others think that it is actually Rodin, as he deeply mulls over the composition of his masterpiece. For others, they think along the lines of the creation of men and that the solitary figure deep in thought is actually Adam, reflecting on what his sin brought to mankind. 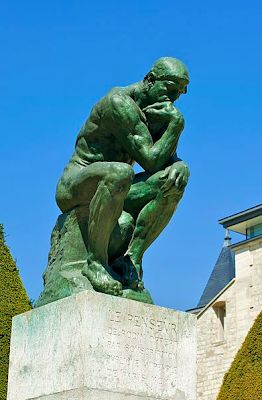 While the interpretations vary depending on who is making it, The Thinker, from its various evolutions, is no longer Dante, Adam or Rodin himself. It has become the symbol of creators and poets anywhere in the world. It is a pity that the museum where the Gates of Hell was to be used was never built. Nevertheless, the original masterpiece gave the world several individual sculptures that also became famous, including The Kiss, Ugolino and his Children, The Three Shades, Fleeting Love, Paolo and Francesca, Meditation, The Old Courtesan, Adam and Eve, Eternal Springtime and I am Beautiful. Six museums display the Gates of Hell. You could find the original plaster cast at the Musée d’Orsay, while three bronze casts from the original are in Musée Rodin, Rodin Museum in Philadelphia and the National Museum of Western Art in Ueno, Tokyo. There is also one in Kuntshaus Zürich, Stanford University and at the Rodin Gallery in Seoul. The different interpretations of this piece of art reflect how human minds are so alike yet so different. The thinking capabilities of humans are beyond amazing and if each one of us would put our brain to right use, this world would become a much better place to live in. Nice blog....thank you for sharing this information..